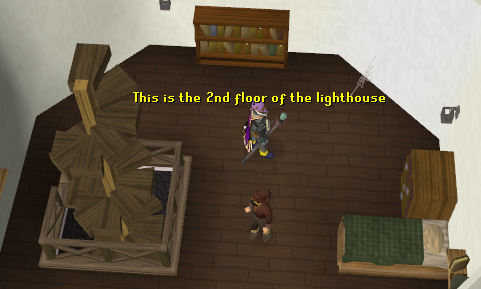 This cold and drafty lighthouse is found to the north of the Barbarian Outpost, and to the west of Rellekka. 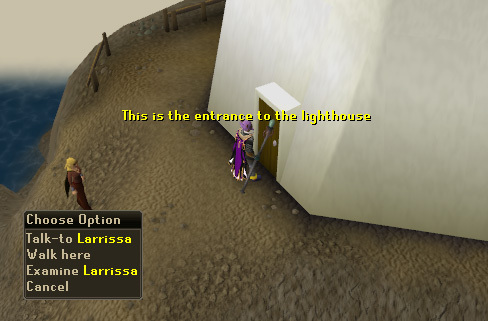 It's used in the Horror From the Deep Quest, which you can start by talking to Larissa. If you're traveling to the lighthouse for the first time, you'll probably be wondering how to get here. 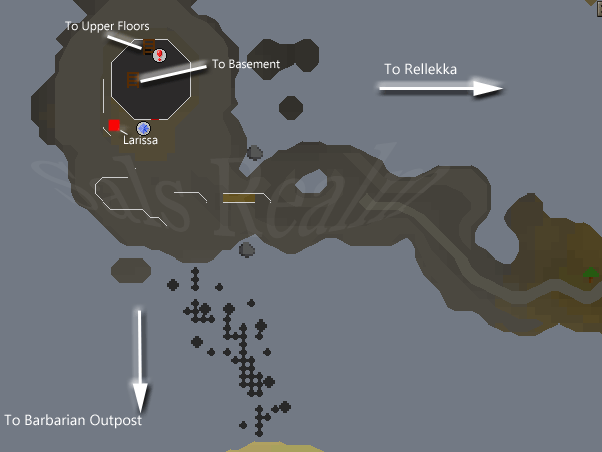 Head to the Barbarian Outpost, located to the north of Seers' Village and continue along to the water. You'll find some stone pillars sticking out of the water; jump from one to the next to reach the island, and to the north will be the lighthouse. This is probably the only reason some people come down here. 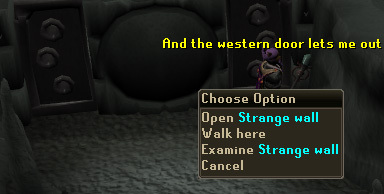 To enter this place you must have completed Horror From The Deep Quest. 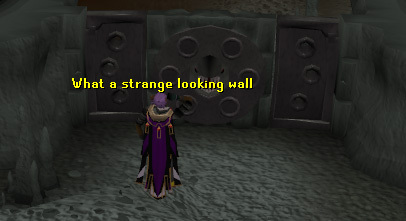 If you haven't, the area will be empty and a level 100 Dagannoth shall be waiting for you. It's infested with level 74 and 92 Dagannoths. This is a good place for training, but watch out: it's a multi-combat zone! To get into the basement, you'll need one arrow, sword and elemental Rune (air, water, earth and fire). The arrow and sword can be of any type, so it's best to use something cheap and replaceable .You'll see a wall with holes in it where you must place each item to open it up. Once you put the items in, you won't get them back. 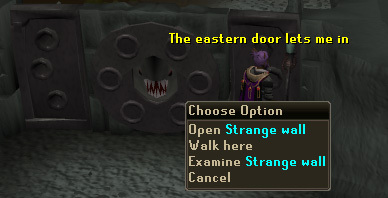 As you now know, you'll need a sword, arrow, and one of each elemental Rune to open the door. This is the main floor. There's not much here, but this is how you'll be able to get to the basement and upper floors. Once you have completed the quest, Jossik gives you one of the 3 God books of your choice, each adds 5 to prayer, along with combat bonuses (depending on the book). After you have added all of the torn pages to your book, you can buy another one from Jossik for 5,000gp. This is the second floor, and the only thing up here is a big light found in just about any lighthouse. This is also used in the Horror From the Deep Quest. She is used in the Horror From The Deep quest. Owns a shop on the second floor. Also if you lose your God Book he will give it to you back for free. If you have finished a god book go talk to him for a new one. Make sure you bring 5,000gp to pay him with. 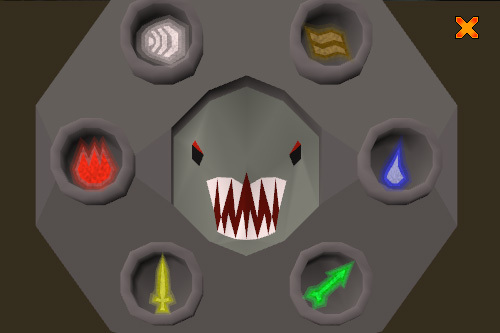 Used in higher Slayer tasks from Chaeldar, Vannaka and, Duradel. 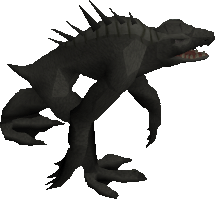 For more info about the skill, see the Slayer guide. 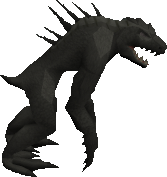 These beasts attack with range so it's best to kill them with range or a cannon. For the best protection, wear full metal armor. These are just about the same as the level 74 ones, although a bit stronger. They hit more consistantly than the level 74 Daggannoths, so if you're a lower level (around 60-65), you may want to use Protect From Melee when fighting them.